Description: Train 425 blasts past the closed tower on the main. 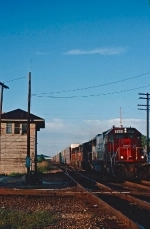 Description: The crew of train 589, behind SOO 2016 and CP 4611, did not have a good run as they have left their train sit at Wabasha, only halfway on their journey to St. Paul. Description: The Soo really went to work on this poor guy! All of the long hood is blacked out. I think this unit used to wear the Hiawatha Scheme. Description: Yes, it was running, switching cars in the container yard. Description: Sadly , this may be the last time i see this locomotive in MILW road paint as they are getting overhauled here. Description: This location is the site of the Solvay coke plant and is just north of the KK River bridge. Description: Now trail only, but still photo worthy. Im glad these are still rolling around untouched (well, CP red anyway). Title: Milw 2016. CP's Tomah Sub. Title: Dos banditos vaya a la sud por Chicago. Description: The black, not so black anymore. The orange, well, lets just say you'd be incorrect to say that color. The Logo's, well, what logo, the GE sticker? Well, its obvious that this unit isn't its old self anymore, but the prime mover is still humming, and thats a good thing! Description: Winona Job (G77) shoves 20 loaded hoppers and a caboose down Wall Street on their way to Bay State. Description: Hopefully most motorists know this sign does not apply to a train. Title: Almost off Wall Street. Description: Soo 2016 shoves G77 towards Bay State, and they are almost clear of the Wall Street, street running. Description: G77 shoves their 20 loads along Front Street, with a classic Bandit GP40 on the point. Description: Soo 2016 is on the point of G77 as the drop 20 loads at Bay State. Description: The Bandit is on ex C&NW trackage along the river front in Winona. Description: Soo 2016 on the point of G77 makes a slight pull so they can cut for a crossing, several cars back in the train. Description: Bandit 2016 pulls past Soo caboose 30 down on Front Street. Description: Soo 2016 sticks out behind the cut of cars it had just dropped at Bay State. Description: G77 has grabbed 13 empties and its caboose, and is pulling back toward Wall Street. Description: A trees branches hang well over the tracks as Soo 2016 pulls G77 down the river front. Description: Soo 2016 pulls its cut of cars down the river front trackage towards Wall Street. Description: The closest rail to the road is almost part of the pavement. Soo 2016 creeps down this trackage only blocks from Wall Street. Description: Soo 2016 brings G77 back onto Wall Street, with a caboose and 13 empties. 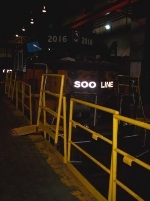 Up until this year the Soo 2016 had been a trail only unit due to a bent frame near the nose, but thankfully the St Paul shops repaired the frame, and did not repaint the unit. Description: An ex Milwaukee Road GP40 leads G77 down original Milwaukee Road street running. Sweet!!! Description: Wall Street, something this city of Winona has wanted removed for years, but its still a lively piece of track. This Monday Soo 2016 leads G77 back up Wall Street after servicing Bay State. Title: Who doesnt love Street Running? Description: A classic scene of some really neat street running on the east end of Winona. Description: Soo 2016 does around 5MPH up the poorly maintained track on Wall Street. Description: Soo 2016 screeches into the tight curve at the end of Wall Street. Title: SOO 2016 CP's River Sub. Description: CP's Winona Road Switcher Power. Description: It was to much snow for G77 to work today. Here Soo 2016 and CP 4608 sit at Louisa Street in a fresh blanket of snow. Description: Soo 2016 sits out at Louisa street covered in the first snow storm of Winter.